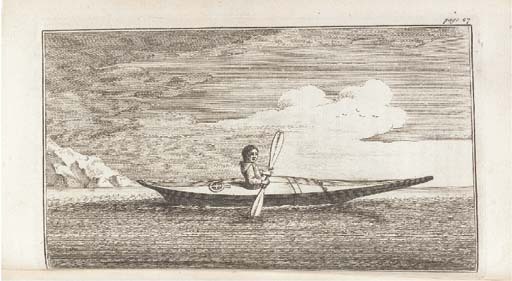 An Account of a Voyage for the discovery of a North-West Passage by Hudson's Streights, to the Western and Southern Ocean of America. Performed in the year 1746 and 1747, in the Ship California, Capt. Francis Smith, Commander. By the Clerk of the California. London: Joliffe, Corbett and Clarke, 1748-1749. 2 volumes, 8° (212 x 132mm). 6 folding engraved maps, 4 engraved plates. (Tears and repairs to five of the folding maps, some browning.) 19th-century red half morocco gilt, t.e.g. (extremities scuffed).